Bridal flowers are a symbol of personal style and elegance. The flowers that a bride chooses for her ceremony and reception can be simple or extravagant. 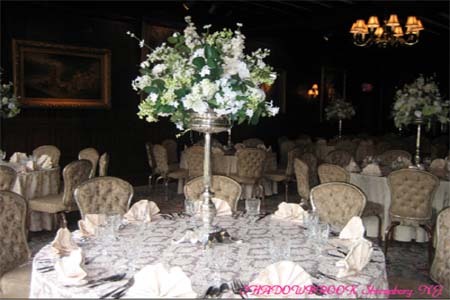 They will reflect the brides taste and flare for decorating. Before we get started making plans, we need to make a few preliminary decisions. Are you looking for silk or fresh flowers, what the budget for your flowers will be, your bridal theme and your general color scheme? (Keep in mind that silk flowers are as beautiful, breathtaking and romantic as live flowers and offer the opportunity to cherish them for your lifetime. They will not wilt in the summer or freeze in the winter. Once those decisions have been made we can proceed. You should begin thinking about your bridal flowers several months before your wedding date. If you are using a florist, make certain to specify any specialty items that you may want in your floral arrangements. Some brides choose to put crystals, pearls or other ornaments into their bouquets and arrangements. There are so many options for your bridal bouquet. Prior to my nuptials, I asked the florist if they could work a small corsage into my bridal bouquet. I removed the corsage just before I threw my bouquet and was able to wear my corsage after my reception and the next day. My Mom hung the corsage upside down to dry it, and I kept it on my dresser for several years. Flower ideas and arrangement choices are endless. You can decide upon roses, which are a symbol of love. Red Roses symbolize deep love and respect. Pink roses symbolize grace and gentility. The American culture symbolizes white roses as security and happiness. Yellow roses represent joy, happiness, freedom and contentment. View examples of a beautiful rose bridal bouquet and learn how to turn your bouquet into a family heirloom. This elegant floral arrangement was created using a tall, silver centerpiece holder and arranging the flowers in a silver dish. Boutonnieres are popular for the groom, groomsman, father of the bride and groom, grandfathers and any other significant men that are in the couple's life. Most brides choose bouquets for their bridesmaids that are not as extravagant as the bridal bouquet but have a similar theme as the bride’s bouquet. Corsages for the mother of the bride and groom are customary. Some brides also give corsages to other important women in their and their hubby's lives. If there is a flower girl, a decorated basket with flower petals for the flower girl to drop as she walks down the aisle is a sweet touch. And of course, if there is a ring bearer, a boutonniere for him is appropriate too. If you are getting married in a church or other religious place, call ahead and see if another bride will be married on the same day as you. You can contact the other bride and perhaps share in the cost of the flower arrangements. Some florists rent floral pieces which could also save you some money. Many brides have the pews of the church decorated with bows, flowers and tulle which add a touch of elegance. The same ideas can be used to decorate a chuppah if you are Jewish. The above breathtaking bouquet is a great choice for a spring or summer celebration. Notice the beautiful rhinestone and pearl accents and how they are placed in the bouquet. The crystals and pearls can be purchased on line or at any craft store. Be certain to let your florist know that you would like these accents incorporated into your bouquet while you are choosing your flowers because some flowers are too delicate to handle beading and other embellishments. 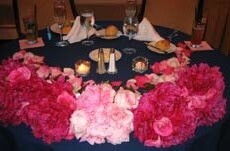 Remember wedding flower ideas can be as simple or elaborate as your imagination and budget permits.